Every store owner knows that a fail-proof way to draw more customers in your store is to offer discounts in your prices. This is not only valid for brick and mortar stores – it is a brilliant strategy to draw more customers into your e-store as well. WooCommerce, this brilliant e-commerce plugin for WordPress knows this little trick very well. So it offers an out-of-the box ability to set sales prices for any of your product and to schedule the dates during which the sales price should apply. But, did you ever wanted to have a page showing only your discounted products? Maybe a “Deals of the day” page? This is exactly what our plugin, Deal of the day does! Select one or multiple products and add them to a dedicated “Sales” page. 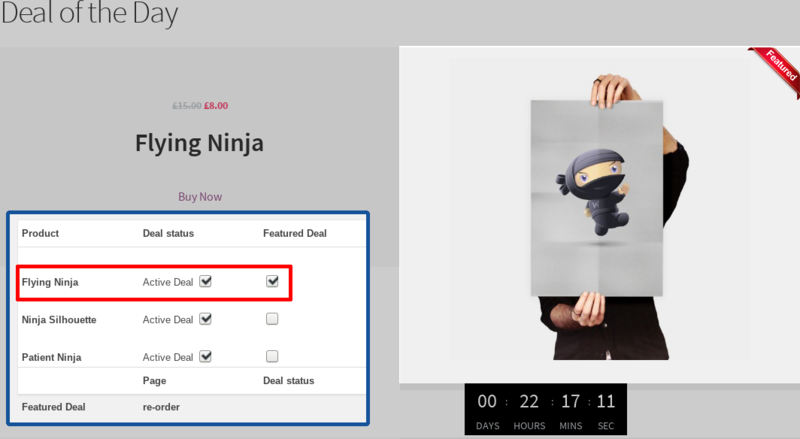 Have automatic countdown timers, to create a sense of urgency to your customers! Use any of our templates to display your discounted products as you want them! Admin panel that allows you to quickly select products for the “Deal of the day” page. Predictive search: Type a few letters of the product name and get an array of options that match. 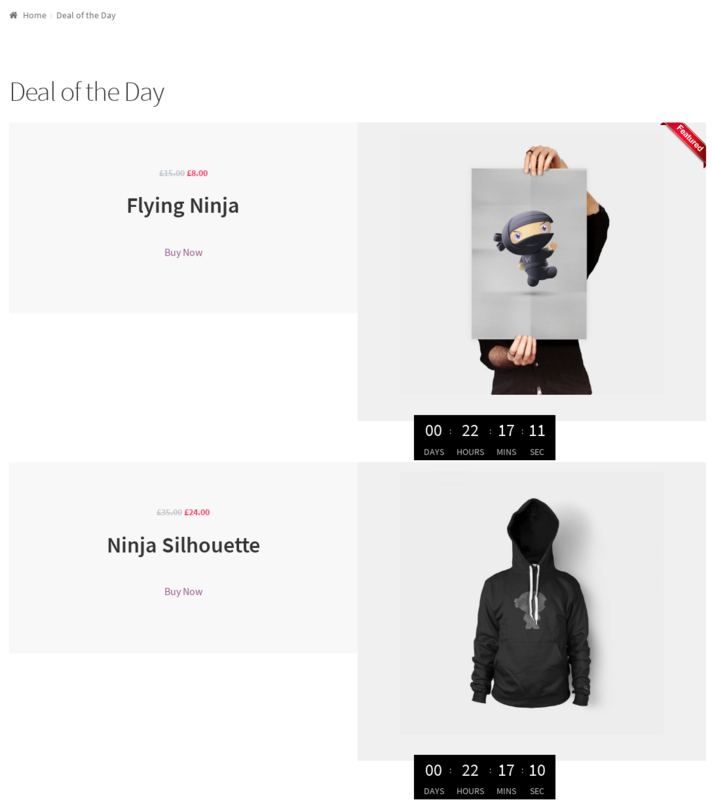 Drag and drop to change order of products in the “Deal of the day” page. “Featured Deal” ribbon for selected products. Choose from 4 different themes. Choose between Default, Full Width and Homepage template. 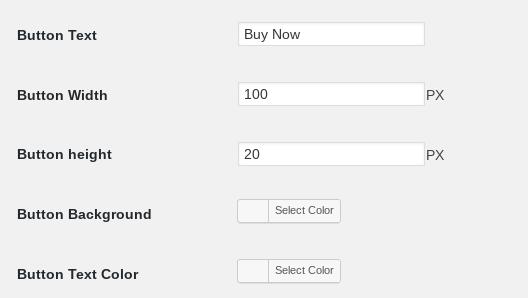 Custom “Buy Now” button text, width, color. Go to the product edit screen. Below the product description, you will see a new section presenting the “Deal of Day” options. 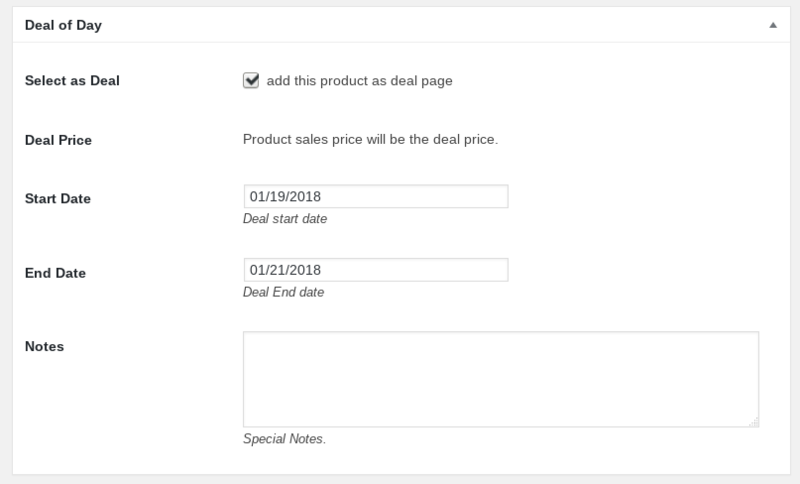 You can change the deal price by editing the “Sale price” in the next section, Product Data. 3. Already have set the “Sale price” on your products? Quickly create your deal page from the “Deal of the Day” section on the Dashboard. Type a few letters of the products name in the search box and choose the product you want. Choose the start and end day of the deal here. Also add any special notes for the product, if applicable. Drag and drop products to select the order they appear on the sales page. Also use the quick links to edit the product or remove the deal. 4. And, that’s it! Congratulations, you now have a sales page, with countdown timers for your super offer!